Any Royal-watcher prepared to rejoice (?) at the prospect of friending the Royals had better moderate his expectations. 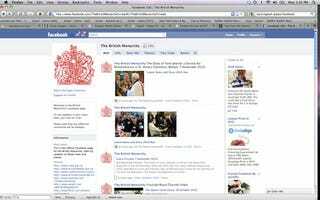 Buckingham Palace's new Facebook page is more "autocratic" than "social." Don't get us wrong: the page is nothing if not comprehensive. Updates come thick and fast ("The Duke of York attends a Service for Remembrance in St. Anne's Cathedral, Belfast, 7 November 2010") and there are pictures aplenty. To dedicated Royal-followers, this will be manna from protocol Heaven. But for anyone anticipating anything more scintillating than "Mr Neil MacGregor appointed to the Order of Merit" you're in for a lesson in the realities of Palatial social-networking. While you can "fan" "The British Monarchy" (and as of writing 87,576 people have) you certainly can't "friend" or be friended by whatever functionary handles the account. Of course, there are commenters to contend with, and naturally some republicans have taken the opportunity to voice their impatience on the page. Says Time, "By 8:15 GMT the Palace web team of two, also tasked with administering the royals' main website, Twitter and Flickr accounts, was scrambling to delete comments that might be expected to give a high-born lady the vapors." Because obviously the queen will be glued to the keyboard, greedily counting her fans and untagging unflattering pictures. But however fast they're editing, a lot of reasoned arguments remain up there — ironically, opening the door for a lively and vibrant real-time debate that no amount of censoring can hide.